So who watched the Jersey Shore? I’ll wait…just admit it you watched it! You fed into the hype but so did I, and I loved every minute of it! It was insanely ridiculous, outrageous and not to mention hilarious. I’m from New Jersey and I’m proud of it, so let me tell you world just in case your wondering, NO not everyone in Jersey has blow outs, tans excessively and listens to techno. BUT, some people do I’ll admit it, and apparently they do in other places as well because there were cast members from Rhode Island, Staten Island and New York too. And although they did make a fool of themselves they are getting hip this time around and demanding compensation for season two, I believe $10,000 per episode. Pauly D is even booking gigs as a DJ, he was actually in the city this past weekend at a nightclub. I know way too much about this, i know, but give me a break the whole country has jersey shore fever. Even celebs! Leonardo Di Caprio is a GTL fan…ok i’ll stop trying to convince myself that my guilty pleasure isn’t embarrassing. Here are some great tanning coupons, Happy January! About six years ago I was exposed to something so amazing, so ground breaking, so revolutionary and ever so essential; eyebrow threading. A little dramatic? I assure you my excitement is warranted. Every girl knows the pain of plucking and the burn of waxing yet we’re sure to make our appointments every two weeks. There’s something about a manicured brow that just makes a face beautiful, isn’t there? My senior year of high school a friend of mine introduced me to threading. Like many I had never heard of the practice but her brows were immaculate from arch to length so I trusted the recommendation. Looking back I really believe this was one of the top five defining moments in my life…OK, maybe top ten. The stylist used a thread, yes like a needle and thread, to shape and define my brows. It was amazing! Threading hurt way less and was much less annoying than plucking, and the stylist only used a small amount of wax to clean up the stray hairs. I was instantly converted and I am proud to say have been six years sober of plucking and waxing, thank you for your support. But in all seriousness I’ve found the biggest pain is finding a good place. 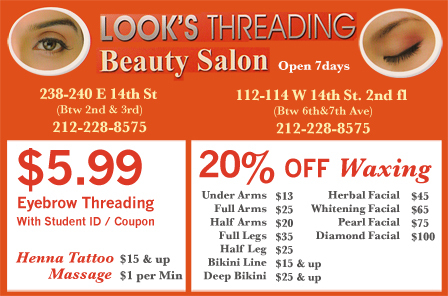 While threading has become more popular now it’s still relatively a word of mouth kind of thing so here are my recommendations, Salon Success on East 14th Street between 1st and 2nd Avenues and Look’s Threading also on East 14th Street between 2nd and 3rd Avenues. Both salons also provide waxing and facial services and for college students on a budget it’s great! Eyebrow threading is a mere $6 with a student ID and coupon found in your campus clipper magazine plus additional savings on beauty treatments. Trust me you’ll never look back! Find out more about Academic Discounts!